Journalist : Antoine Gigal, who are you ? 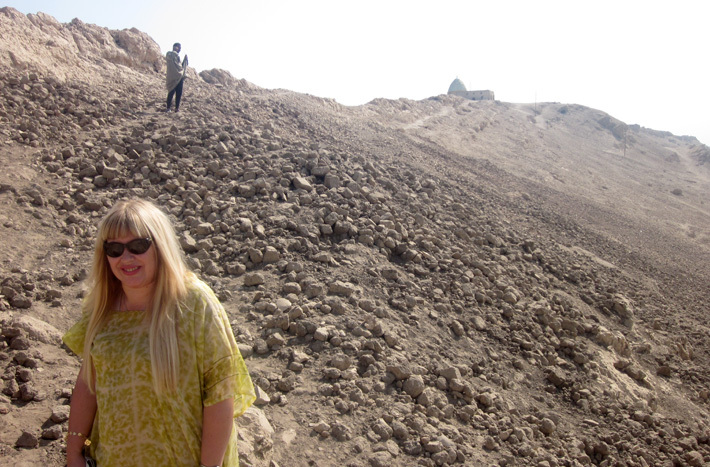 Gigal : I am a woman and an independent Egyptologist researcher,explorer and author. Journalist : But why this pseudonym ? Gigal : This is my pen name for obvious reasons for those who are familiar with my fieldwork. My pen name is a form of protection since I am one of the very few women who study the most remote archaeological sites throughout Egypt. To continue my research I need freedom to investigate these sites and freedom to report. So in that perspective I needed a masculine pseudonyme to better conceal the connection, but I am aware that this might confuse my readers who may think I am some kind of old bearded scholar ! This is a real surprise for them. But there have been many precedents in our History : take Georges Sand ( a famed french lady writer of the 19th century) for instance ! Journalist : And now ? Gigal : My pen name is well-known now and it is too late to change althought I unveil a part of me to some people who honour and trust my writings and research with their appreciation. However, now it is time for me to share what I have learned and what I will learn, as much as possible. Some sites are too far or restricted areas for the general public. I use my permits to share the most possible with my readers. Also, in the « public » sites what matter the most ,is not always shown. A lot of things are overlooked. Journalist : You are coming back to France for several months ? Gigal : Yes, because I have to write. I have many books on the way but it is impossible for me to write in Egypt because I always want to be outside exploring. Also I am frequently approached by other people who want to discuss things and there is in Egypt a human warmth that matters very much to me. Journalist : What is your approach ? Journalist : But what can this past, this Ancient Egypt, teach us nowadays ? Gigal : All cultural forms in Egypt talk about the mystery of our existence in the universe, a mystery that allows Man to grasp knowledge and participate in his secret nature. The ancient Egyptians are a source of knowledge humankind can draw from, and therefore participate in its intrinsic nature, provided that this is subjected to sincere, honest and pragmatic research, and that we go back in time as far as possible. That is what I try to do at my modest level. The mystery of existence is a characteristic of our lives. It truly exists. We exist and live in that mystery, the extraordinary nature of our reality that scientists nowadays describe with quantum physics and relativity in a less materialistic way, implying a new ethical perspective for most of us and implicating the planet as a whole. Present day humankind is searching for solutions for survival and the ancient Egyptians managed to pass down through the ages a lot of valuable knowledge, in spite of destruction, falsification, disinformation and incomprehension. I even came to think that they had developed specific techniques to pull it off. By the way, I sincerly think it was their primary goal to transmit a precious Memory for Humankind’s decisive moments. Thanks to this transmission, Humankind can situate itself and understand the universe and its cycles. In classic Egyptology, we pretend that quite everything started around 3500 B.C, and that from ignorant nomads, all of a sudden colossal monuments appeared - that we would have trouble reproducing even today by the way -, a sophisticated agriculture and irrigation, omniscient high priests, hundreds of Gods, etc… There is a problem here ! The sudden anthropogenesis cannot satisfy curiosity and intellectual honesty. Consequently knowledge cannot evolve unless people are willing to go off the beaten track to think differently. It is important not to be bound by the comprehension of the only present. Gigal in the fieldwork 2010. Journalist : What does the Egyptian territory inspire in you ? Gigal : Let’s see, I‘m going to talk about another country to explain it: in Japan space is conceived as an « arch. of mystery », this mystery is offering man a possibility to build and construct within itself. The Egyptian territory typically is that arch of mystery, a paradoxically ordered space, carefully subdivided a long time ago, into 42 Nomes with boundaries perfectly marked by irrigation canals. This land was planned, subdivided and quantified more than any other at any time in history on both sides of an almost straight river running from South to North, with its myriad of underground networks stretching from Giza to Libya, from Mokkatam (a Cairo East district) to the Red Sea, and to Abydos… And there is the enigma about our origins, and about what the ancient texts and scriptures tell us regarding a life originating from the circumpolar stars, strange red ancestors, the Bee Kings, the underworld of the Duat, a sort of doorway to the stars and the mysterious land of Punt…there are quite a lot of things to elucidate ! Journalist : And how do you search ? Gigal : Partly from academic sources, very necessary in order to find the original texts and translations I do again ; partly from excavation reports, thesis and books in several languages ; partly from a confrontation with the reality of the fieldwork, the « terrain », because it is necessary to efficiently compare and immerse oneself in the sites. I use to come back dozen of times in a same site. Geology, hydrology, ancient maps and to day satellite ones are very important too. There is also an indispensable element that a good many scientists ignore too often. Journalist : What is that ? Gigal : It is the famous oral tradition that still endures on the African continent. A few Egyptians near archaeological sites are the chosen and respectful receivers of the teachings and memories of their Elders, preserved with extreme precision. Their Memory is fabulous and they can go far back. But to approach this body of knowledge , many years are needed to earn their trust and to prove oneself. Thanks to this oral tradition one can make even further progress. 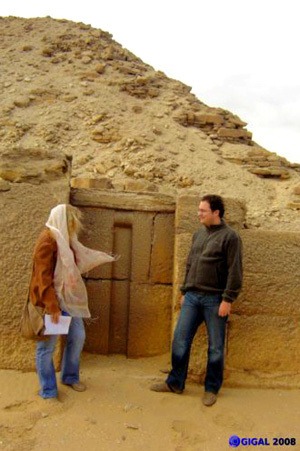 Interview of Gigal in Egypt 2007. Translation into English by Antoine André, 2010.